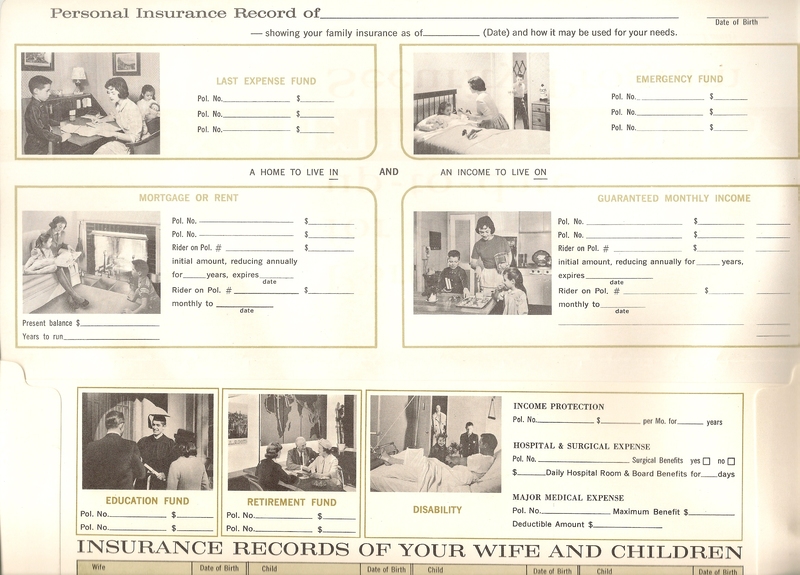 These were rather clever little folders in which the insured was urged to keep information about insurance records and other important documents. After my Dad died and my Mom moved into a retirement home, I saved these envelopes, partly out of nostalgia, and partly because I thought they might come in handy. The folders never came in handy and my need for closet space has outweighed any lingering nostalgia. Keeping the folders won’t bring either my Dad or my childhood back. I therefore decided to throw them out. Before throwing out the folders, though, I riffled through them to make sure that none actually held any of my Dad’s insurance or tax records. Those would have been historically interesting, but none existed. What I did notice as I thumbed through the folders was that not all of them had the same photos. It took me a second to figure out what was going on. 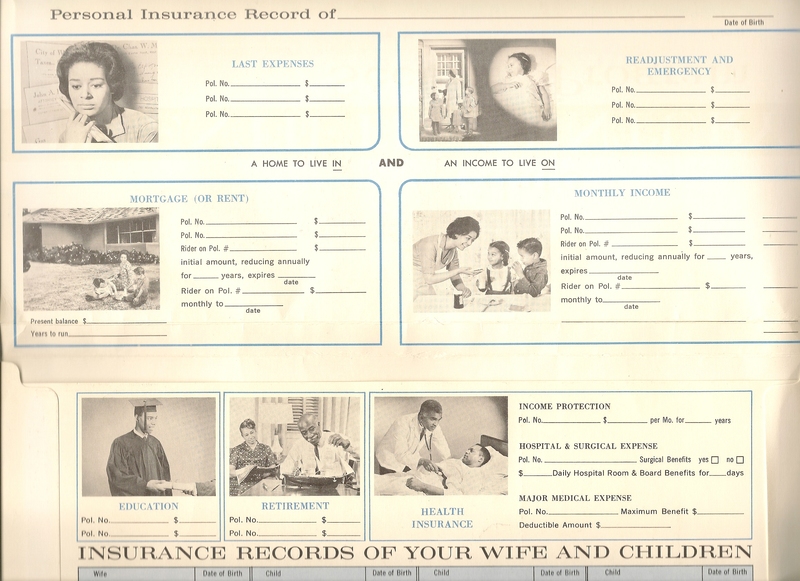 Back in 1963 and 1964, when Twentieth Century (part of the Prudential Insurance Company) was printing up these handy-dandy folders, it prepared segregated versions, one for its black customers and one for its white ones. There’s nothing demeaning about the black images. As with the white ones, they have nice homes, sweet children, proud-graduates, and well-insured sick people in nice hospital beds. It’s just that, both the folders confine themselves strictly to one race. I wonder whether Asian families got the black or the white version…. A friend asked me what I thought of an Atlantic article pointing to the fact that, sixty years after Brown v. Board of Education, America’s schools are once again becoming segregated, as whites (and Asians and East Indians) do whatever they can to flee predominantly black schools. Black schools are academically much, much weaker than white schools and, as the whites flee, the infrastructure of the schools declines. The article focuses heavily on the fact that academically-oriented black children suffer badly from this de facto segregation, and strongly implies that white racism is at fault. I readily concede that this re-segregation is happening and that the tragic result is that bright black kids are having their futures destroyed. I don’t believe, though, that whites (and Asians and East Indians) are motivated by racism when they abandon previously integrated schools. Hispanic culture is also resistant to education. As to that, I actually have some first hand anecdotal data from people who have worked closely with the Hispanic community in the education context. In the late 1980s, very upper crust Hispanic friends of my family had set up an institution to try to teach Hispanic parents to encourage their children at school. These friends told me that the parents, most from rural areas, had the farmer’s mindset, which is to get the kids out of school and to work as soon as possible. Even though the parents came to America for economic opportunity, they couldn’t wrap their minds around the idea that, subject to some exceptions, education is the key to economic success in America. Children old enough to work were actively discouraged from seeking an education. Twenty-five years later, my sister-in-law, who works in the Los Angeles school district, tells me the same story: Many Hispanic parents prefer their kids to earn some money sooner, rather than more money later. Sure, there’s a bell curve, with certain black or Hispanic kids and their families focused hungrily on an educational goal but, for the most part, neither the children nor their parents focus their energy on education. White, Asian, and East Indian cultures, for the most part, are obsessed about education as a necessity for thriving in America. Parents in these cultures understand that the school’s intellectual environment matters. If the school culture sees every parent in the community demanding hard work and high grades, that will trickle down to the children, who will create a competitive, exciting academic culture. So yes, white parents are fleeing predominantly black schools (and doing so in whatever way possible), but they’re not doing so for the old-fashioned racial reasons. It’s all about education cultures versus anti-education cultures. Culturism, right? I anticipate that someone will point out that the same article says that, when the schools were first integrated, the integration was successful. I don’t doubt that. 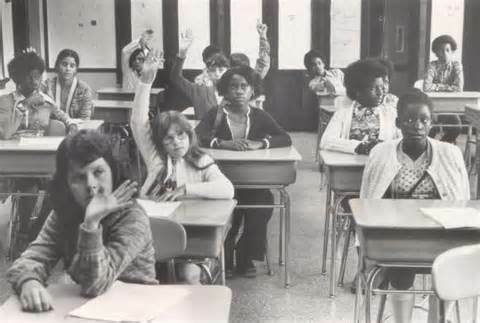 Back then, integrated schools were thrilling, shiny, new toys. As the toys lost their gloss, though, people made less of an effort. More importantly, though, the integration happened thirty-five years ago. That’s an important date, because it was before political correctness came along to poison things. In the late 1970s and throughout most of the 1980s, teachers could reasonably expect equal effort from Joe Black and Moe White. Thanks to the scourge of political correctness, however, it’s now racist to expect black students to work as hard and perform as well as white students. Heck, with microaggression, a new twist on political correctness, it’s even racist if the teacher, when he walks into the classroom, says good morning to Moe White before he says it to Joe Black — never mind that Moe White sits next to the door, while Joe Black sits on the opposite site of the classroom. Culture, not race. Culture, not race. Culture, not race…. Although that’s not quite true. There is a horrible racism pervading the American education system, but it comes from the Left. The Left has successfully argued that blacks are so mentally inferior to other races that they are incapable of elevating their culture to include good behavior, hard work, and ambition. Until that grotesque Leftist racism is killed, and blacks are recognized as fully equal to other races, and therefore capable of academic rigor, whites, Asians, and East Indians will do anything they can to insulate their children from black (and Hispanic) culture in America’s public schools.